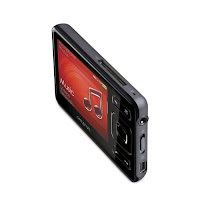 The Creative Zen is a sleek portable MP3 player that can play videos, audios, and unprotected music files. It's an update to the Zen Vision except that the Creative Zen doesn't have the big capacity of the previous Vision. It only comes in 4GB, 8GB, and 16GB capacity. 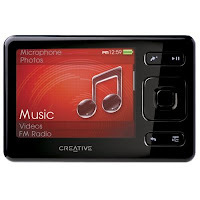 The Creative Zen is a flash based player with a 4GB, 8GB, and 16GB capacity and a SD card expansion slot. It also has a FM radio player, 2.5 inch screen, built in voice recorder, weighs around 2.3 oz and capable of handling AAC, MP3, WAV, WMA, ADPCM, and Audible file formats. Compared with the new generation of iPod mini, the Creative Zen has a larger screen, about 2.5 inch which makes watching videos a lot better compared with smaller screens. The screen is capable of outputting 16.7 million colors and though not as rich in color as the iPod mini's screen, it is capable of delivering good quality videos. The Creative Zen has a slim card design and it actually reminds me of the back of a digital camera. What is great about the Creative Zen is that although its capacity has been greatly reduced from the previous Zen Vision, it is a flash based player which means you can add as much memory as you like and transfer it from one flash player to another. Sound quality on the Creative Zen is great in whatever genre of music. What I hate most about the Creative Zen is the earphones that comes with it. Like the iPod's earphones, it's total crap and you're better off buying a high end earphone. The buttons are also a little bit hard to work with and unresponsive, or maybe it's just that I got used with touch sensitive interface---maybe not, there's a click sound with every button push that made me think of cheap plastic toy. Another disappointment about the Creative Zen is that is it has no SD card integration, simply put, it means that songs stored on your SD card are not automatically read, you have to browse your SD card and then manually play your files. Why make a flash based player when there's no SD card integration?! With that said, I have to say that the Creative Zen is a pretty decent affordable player. I bought a creative zen from the gadget shop and i'm pretty impressed, definitely a huge contender for apple. Creative ZEN's are garbage, mine worked for about 6hrs and then dead, they sent me another and a couple months later of mabye 8hrs worth of use and the replacement was dead. And they want me to pay shipping again to send it back. You got to be kidding. My advice is stay away from this product and thier customer support is anything but support. LOL. There's always the chance that you're unlucky enough to get a defective product--twice!